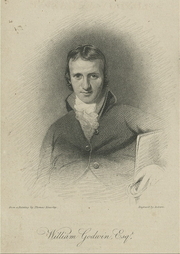 William Godwin's son, known as William Godwin the Younger (1803–8 September 1832) wrote a novel Transfusion which as yet is not cataloged on LibraryThing. When it is, this page will probably need to be split. William Godwin is currently considered a "single author." If one or more works are by a distinct, homonymous authors, go ahead and split the author. William Godwin is composed of 4 names. You can examine and separate out names.